You are currently browsing the The Pet Product Guru blog archives for the day Sunday, April 10th, 2011. Both dogs and cats shed hair year round. They shed more hair as their coats thickens and thins. Typically this is in the fall and the spring. The amount that your pets sheds is due to the amount of daylight rather than the outside temperature. There are some other factors that affect shedding. They are nutrition, hormones and stress. Some breeds such as poodles and some terriers shed very little. These dogs need more grooming that the other breeds. Shedding is much more noticeable in dogs and cats with long, thick hair. Unless these pets are groomed regularly, mats can form. These mats can lead to skin conditions such as hot spots. The mats are best removed with clippers as scissors can accidentally injure your pet. Any bare, itchy, or raw areas should be brought to the attention of your veterinarian. 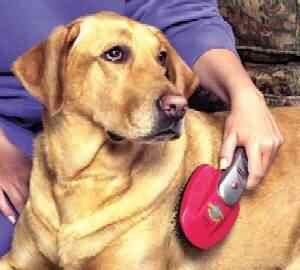 The best way to deal with shedding is with regular grooming. Brushing your pet daily removes dead hair, removes mat formation and cuts down on hair within the home. Many pets really enjoy daily grooming. My older cat knows that her brush is in a cabinet below the bathroom sink. Every day she goes over to it and nudges it which tells me that she wants me to brush her. You can buy dog and cat grooming supplies at any pet store.